Hello friends! Let me tell you I’ve had some busy days making preparations for the most important day of the year – the 5th of December. Since I’m a very humble kind of guy I don’t tell you it’s my birthday. Ooooops ….hehehe ….. me and my big mouth! 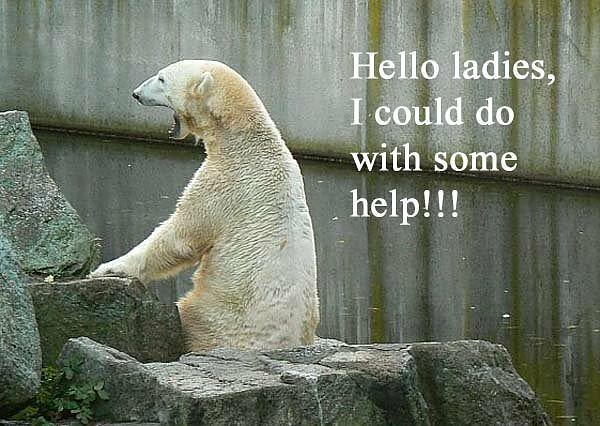 Even though my service personnel cleaned the enclosure I noticed they’ve missed several spots and that simply won’t do! Everything’s got to be perfect on the special day so I decided to make a total make-over of my home. I tried to make the aunties help me but they just murmured something about a beauty nap and pretended not to hear me. Luckily Fräulein Flocke kindly lent me her vacuum cleaner so I could get started. 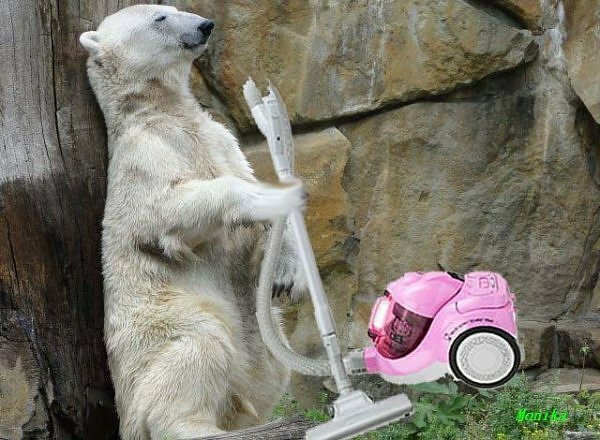 She even sent me a pink apron but com’on – there are limits for what a world famous bear can wear! I also phoned the Agency for Cleaning Ladies but oh my, how difficult it is to get hold of decent cleaning personnel these days. This is the best they could do ….. although I must say she – or maybe he? – is very efficient! At least she’s better than the three lazy aunties! We worked very hard but the result is smashing! I don’t think there never, ever has been a cleaner enclosure. We both needed a bath! Oh, dear, I must remember to make an appointment with my stylist Monsieur Knuves. 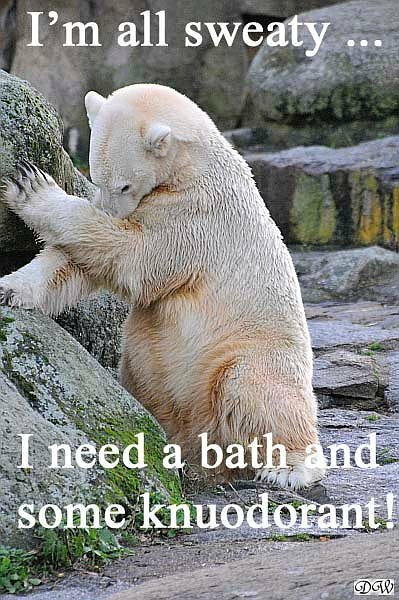 Really – my fur is a mess and I’m in urgent need of a pawicure. I’m not preparing any food for you because I know you’ll have your own parties in Zur Kneipe and at Joe’s. That’s a good thing because maybe you know how difficult it is to keep the food fresh. Well, frankly it’s difficult – as a matter of fact impossible – to keep the food from being eaten by these gluttaneous ladies … and of course, I would be forced to make thorough quality controls. I wouldn’t dream of serving bad food to you. A cricket ball – Hello Ralph! I know the list is very short but as I already told you – I’m a humble kind of guy! It looks like everything’s done and now I can lean back and start dreaming of a wonderful day with lots of visitors. I’ve heard rumours that many of my fans abroad are coming, too. I’m so excited. How many nights do I have to sleep until it’s the 5th of December? 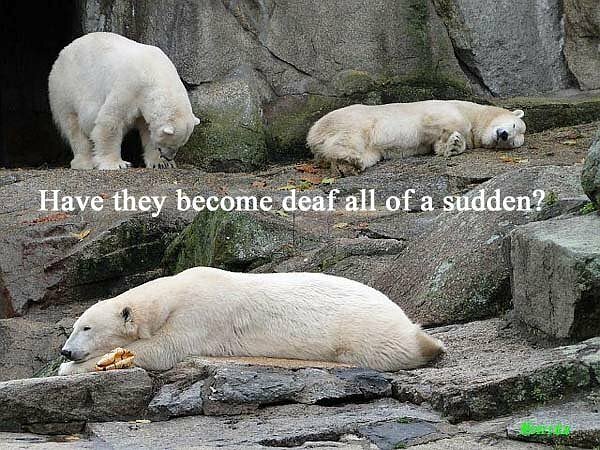 Dear Knut! We came running and I’m sure many of us would be in Berlin today if only …..
You certainly hold the whole world in your paw – and you still put a spell on us! This would have been your 12th birthday …. We miss you so much! 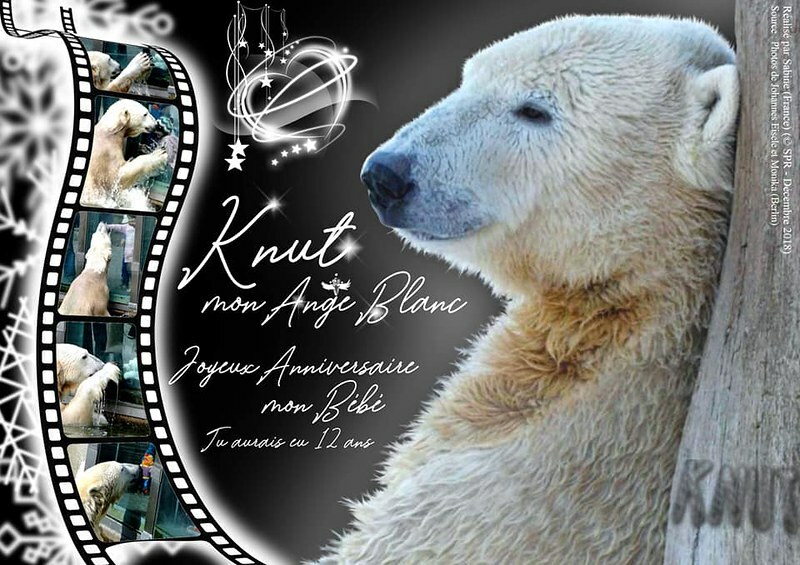 Dear bear angel Knut – Happy birthday to you in the Bear Heaven! Ich sag euch jetzt mal, dass ich ganz schön mit den Vorbereitungen für den wichtigsten Tag des Jahres – den 5. Dezember – zu tun gehabt habe. Da ich aber ein bescheidenes Kerlchen bin, verrate ich euch nicht, dass ich da Geburtstag habe. Hoppla…………hihihi…….ich und meine große Klappe. Ich werde nichts zu essen für euch vorbereiten, weil ich weiß, dass ihr eure Partys in „Zur Kneipe” und bei „Joe’s” feiern werdet. Das ist gut so, weil ihr ja vielleicht wisst, wie schwer es ist, das Essen frisch zu halten. Nun ja, ganz ehrlich, es ist schwierig -wenn nicht sogar völlig unmöglich – Essen vor den drei verfressenen Damen in Sicherheit zu bringen ….und natürlich wäre ich ja auch gezwungen, die Qualität ganz sorgfältig zu prüfen. Nie im Traum würde ich es wagen, euch schlechtes Essen zu servieren. Thank you, dear MERVI, for your new words accomapnying an old (not odd story/publication from 2010). I love your words as much as I love all the pictures! Yes, a ‘CHRISTMAS PRESENT OF ITS BEST’! 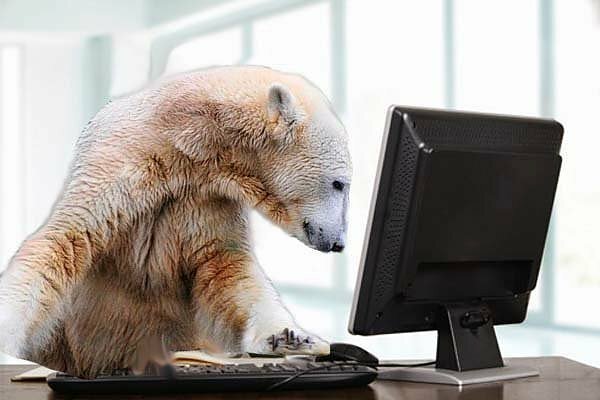 – and it’s exactly because of KNUT and the fact that HE was the ‘Xmas-present’ or let’s say the ‘SANTA CLAUS’-present’ in 2006 that we did get so much addicted to polar bears. HAPPY DAY to EVERYONE! – with best memories of ‘our NUMBER ONE TREASURE’ most probably for the rest of our lives . . .! Wie schön war es damals. Aber wir haben ja unsere Erinnerungen. Bonjour à toutes et tous ? 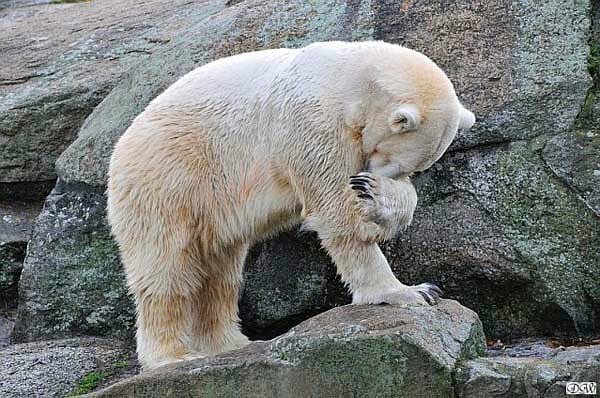 Knut aurait eu 12 ans aujourd’hui si la vie n’en avait pas décidé autrement. Tu me manques mon Ange Blanc ? Vous souhaitant à toutes et tous une excellente journée. Thank you for your words and thank you Mervi for all you have done here and in the Knuipe,, and to everyone who posts stories and pictures. 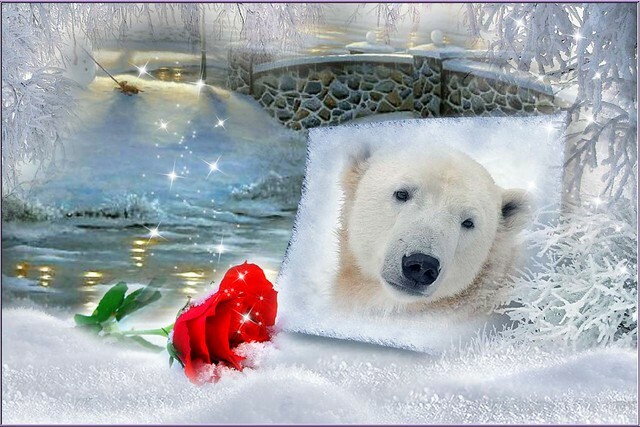 The images of Knut and the story show why we continue to hold him in our hearts. For me, he still walks beside me, always as a young bear now, looking up and hoping for a Croissant or a Herring. I don’t know about faith or fact but Hope, as in Flocke’s first child, allows me to think that Knut and Thomas are together, and that Tosca is with them. She was always Thomas’s favourite bear. Of course Nancy will be there as well, licking a favourite ear. Corinna will now be able to lick Anton’s ear too. As for Kati, I wish her when the time comes, a place full of smells and food, and a soft place to rest. 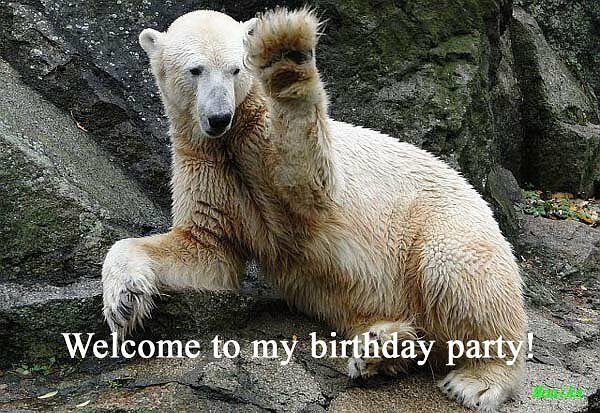 I remember the last birthday of Knut. 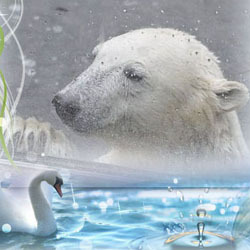 It was a wonderful time with a lot of hope for Knut’s life. Unfortunately the things turned different way. Deine Geschichte über Knuts Vorbereitungen zu seinem 4. Geburtstag sind eine wundervolle Erinnerung. Wie gerne würden wir ihm seine Wunschliste auch zum 12. Geburtstag erfüllen, nicht wahr? 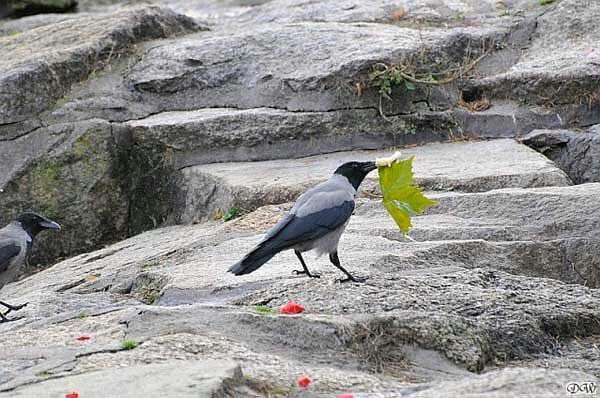 auch liebe Grüße an sie. 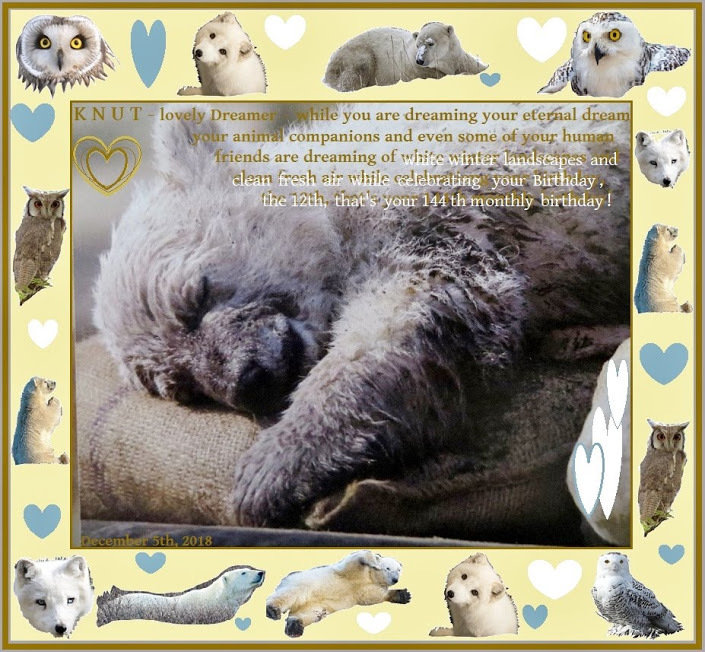 Happy Birthday dear Knut in heaven! 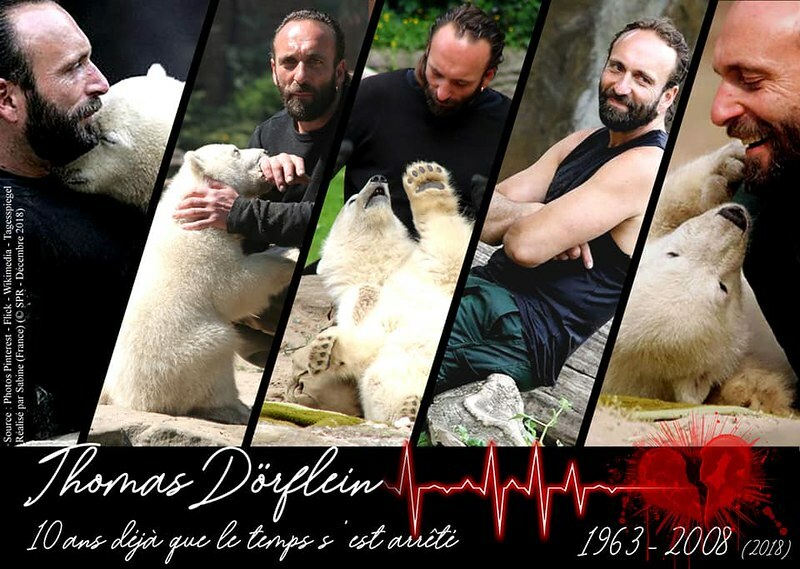 Thank you for this charming story and the touching memories of our bearboy Knut. How we would love to fulfill all his birthday wishes if only he was still with us . He was such a sweetie pie and as always I alternate between joy and grief when watching these affectionate collages and reading your delightful story around. 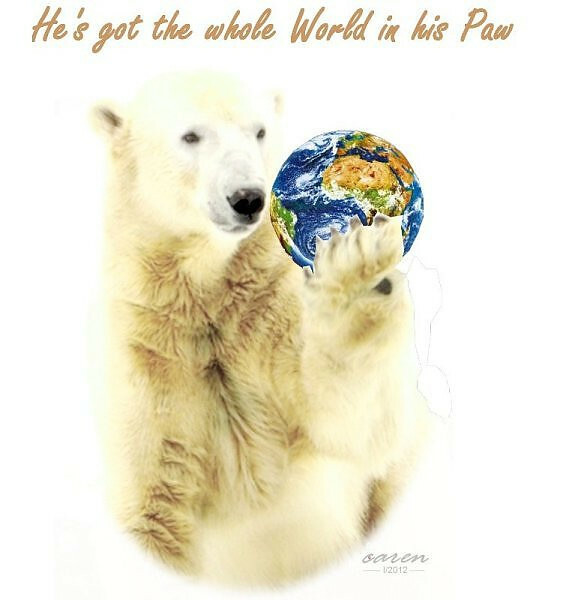 We still have the power decall ” He´s got the whole world in his paw” fixed at a pane of our “Käfer” and we keep it with pride! It still works, we only had to change the batteries from time to time. Log in | 53 queries. 0.810 seconds.